With v2.0.0 of the Analytics Edge Standard Add-in, it is now possible to run a specific Analytics Edge query from a button on your worksheet (the Analytics Edge Standard Add-in must be installed). This opens the door to interactive refreshes and improved user experiences. CAUTION: This will ONLY work on worksheets with names that do NOT include spaces. Add a Form Control Button to your worksheet and draw the button on your worksheet. 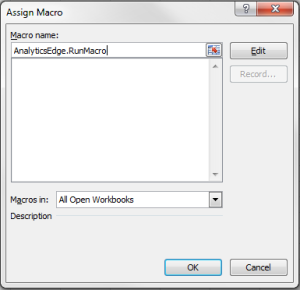 When prompted for the Macro name, enter AnalyticsEdge.RunMacro. Click OK.
That’s it! Now you can just click the button to run the Analytics Edge macro! This entry was posted in A. E. Standard Add-in on 2017/09/21 by tutorials.